Buying anything online these days is easy. The lack of overhead, cost of employees, and maintaining inventory drives prices down so that making purchases online will save you money even when you include shipping costs. We’ve all become spoiled by Amazon.com, eBay, Walmart and similar sites that allow us to purchase almost anything our hearts desire from the comfort of our homes while wearing pajamas. 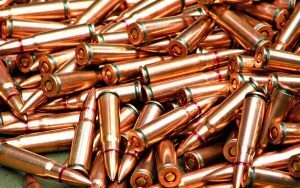 Why should buying ammunition online be any different? It’s impossible to state which is the best place to buy ammo online due to changing prices, supply and demand, sales and promotions or shipping costs. If you are seeking a specific type of ammo you may be limited to a small handful of stores. That being said, we do have our our #1 choice as well as some other top rated sites we use. Exhaustive research has led us to our favorite online ammo store. Ammo.com offers the widest variety of ammo at outstanding prices that we’ve found online so far. For ease of use the ammo is split into categories as well as calibers and there are reviews on many calibers. No more scrolling through endless pages to find that one special item. Longtime customers at Ammo.com rave about their fast shipping and service and so do we. Many also belong to People of the Gun, a group of firearms owners, bloggers and supporters of Second Amendment rights. This isn’t just a website for selling ammo deals; it’s a site that donates 1% of the purchase price to the Pro-Freedom organization of your choice, including the NRA and the Second Amendment Foundation. They also maintain a “Resistance Library” filled with articles regarding a wide variety of topics from self-defense to preparedness, and provide a FAQ section for information about shipping to restricted areas. Academy Sports – Great prices, free shipping on orders over $25. Site is easy to navigate. Brownells – Longstanding reputation as a source for ammo and supplies. Offers 100% guarantee. Bulk Ammo – Carries a wide selection of bulk ammo including hard to find items. Cabela’s – Excellent reputation. Carries most major brands and also offers advice for novices. Cheaper than Dirt – Single box and bulk ammo sales. Also carried high-performance match-grade and self-defense ammo. Lucky Gunner – Top site offering cheap ammo that’s always in stock. Offers great prices on bulk ammo. Natchez Shooters Supplies – Large assortment of ammo including bulk ammo. Offers free shipping on large orders. Outdoor Limited – Consistently receives excellent reviews. Guarantees fast shipping and no back orders. SGAmmo – Wide selection. Delivers fast and accurate service. Beware of sites that don’t immediately quote shipping prices. Even if the site promises the best ammo prices, your great deal can suddenly turn into an expensive venture. Learn the ins and outs of the store before you buy ammo online. Does the store show which items are in stock? Take time to read store reviews. A store may offer excellent deals but if they don’t have reasonable shipping times, that excellent deal becomes an exercise in frustration. Do your homework. Buying ammunition online is fast and easy but can cause a big headache if you violate local, state, or federal laws. At the very least you won’t receive your order and end up paying shipping or restocking costs.